E-mail marketing is the holy grail for fashion brands. It’s important because it allows companies to provide highly targeted messages to a captive audience that has opted in to receive information from you. A Forbes article explains why email marketing should be top priority for small business owners. Relative to other marketing vehicles like Facebook and Twitter which have fleeting messages which may or may not be seen depending on your organic reach and how much money you put behind campaigns, sending a newsletter is cost effective and provides a robust amount of data and integrations with other popular small business solutions like Shopify and Facebook. When you craft your campaigns, you should of course, talk about the product. And, if you’ve baited your subscribers with benefits like “be the first to know” or “get exclusives” they will be expecting that type of product message. At the same time, it’s important to diversify your content. Consumers are usually not only buying your products for product sake, but they are buying into the dream of your brand. And, since they most likely have access to your world through social media, it’s important to further communicate your brand story through e-mail marketing. 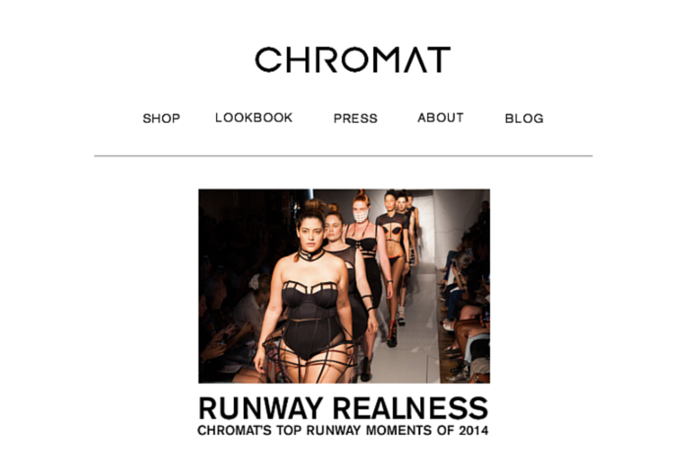 Chromat, a lifestyle label always pushing creative boundaries frequently sends out newsletters highlighting the brand's accolades such as press, celebrities wearing their pieces and did a year-in-reivew of runway recaps. Womenswear label Study shared their year by listing the 10 things they were grateful for and included their move to the Brooklyn Fashion + Design Accelerator, new products, stockists and more. Both of these examples feature compelling content for the reader beyond product messaging.